We were up at 0600 and had breakfast at 0630. We had planned to leave camp at 0700 but, due to various logistical problems, we didn’t leave until 0815. We drove to the village of Yelwandugeri, where we met some of the Yankari staff who had been monitoring the elephants. We switched to 4-wheel drive vehicles and drove on undeveloped dirt roads to our departure point. At 1000, we started hiking. We hiked to the boundary of the Reserve, which is marked by a two-meter wide clearing referred to as the “cut line.” We followed the cut line to where we met the rangers. They had monitored the elephants throughout the night until villagers, concerned for their crops, harassed the elephants and drove them off. We were at a point on the cut line where the elephants had reentered the reserve. We started following the tracks. After about an hour of hiking, Dr. Aisha began having some problems with her feet due to a new pair of boots, but refused to go back. We continued, albeit slowly. After another hour of hiking, we realized that we were not gaining ground on the elephants, so we decided to divide into two groups—one composed of fast hikers and the other with slower hikers. 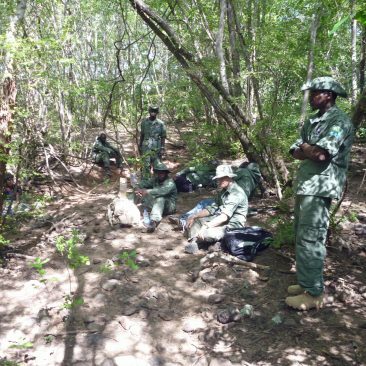 The rangers thought that the elephants were headed for a water source near an unmaintained dirt road. We hiked for an additional hour, and then some of the members of the fast team began to fall behind. 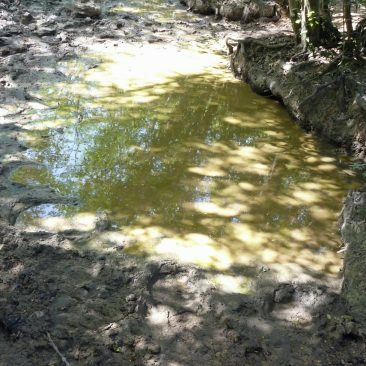 We reached the water source, which was almost dried up. The elephants had been to the water point, but probably could not have gotten enough water to satisfy them. There were cattle grazing in the Reserve near the water. The herders were arrested. We split up again at the water point. The slower faction headed for the dirt road and the rest of the team kept following the elephant tracks. After an hour, we crossed the dirt road north of where the other team had hit the road. We had not made any progress on catching up to the elephants, so decided to call off the tracking. It was 1500. At this point, we were a long way from the vehicles. We were in radio contact with Gilbert, who was leading the other group. Gilbert sent a ranger to the nearest village to rent a motorcycle taxi to take him to the vehicles, who were out of radio range. After two hours, Gilbert had not heard from the ranger, so he decided to hike to the village himself. As he approached the village, the ranger was leaving on a motorcycle. They both went to the vehicles and started driving to pick up the two groups. By the time we were able to reestablish radio contact with Gilbert, it was 1900 and dark. By the time the vehicles reached us, it was 2045. By the time we reached camp, it was midnight. We had dinner, showered and went to bed. I was up at 0600 and had breakfast at 0630 with Andrew. We were the only ones up. Everyone else slept in. We finally left camp at around 1000. We drove to the Gaji River and then drove north along the river for several kilometers. We did not see any elephant signs, but we did see hippos in the river. 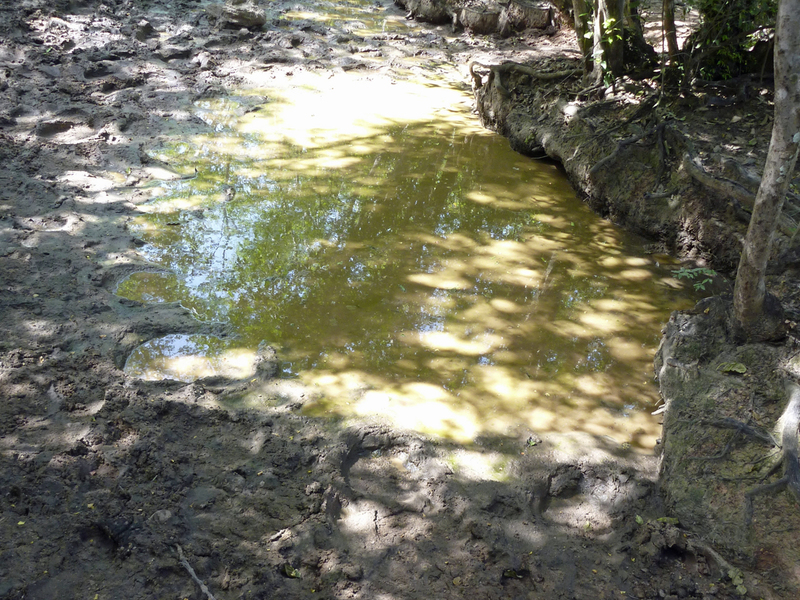 We then returned to the main road and continued north and checked around several water holes for elephant signs. We found none. We then drove to the northern boundary of the Reserve and headed west along the border. We then headed south, along the boundary, following game drive roads. We did not find any fresh elephant signs. The game road we were on came out at the main road at Wikki Camp. We arrived back at camp at 1830. 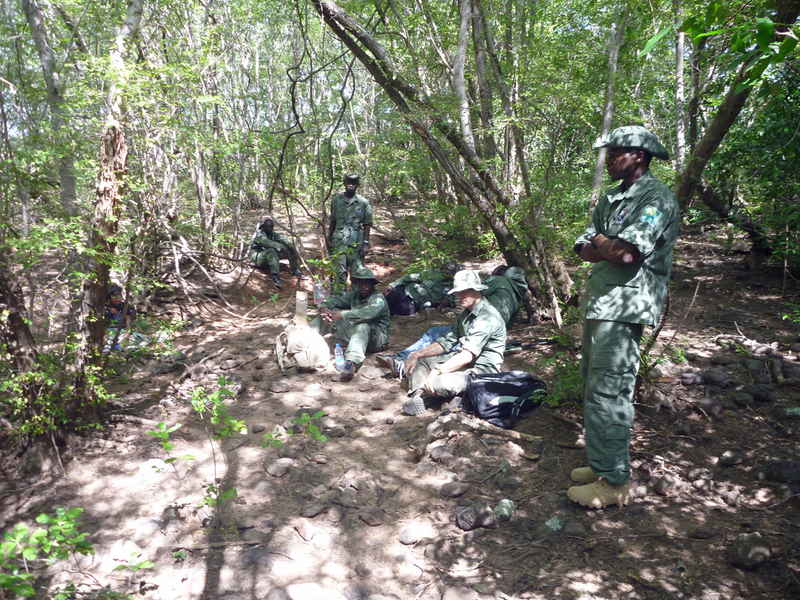 Rangers split into two teams to search the northeastern and northwestern sectors of the park. They did not find any fresh elephant signs either.